8,000 BTU isn't enough to cool your entire home, but it’s perfect for single rooms. 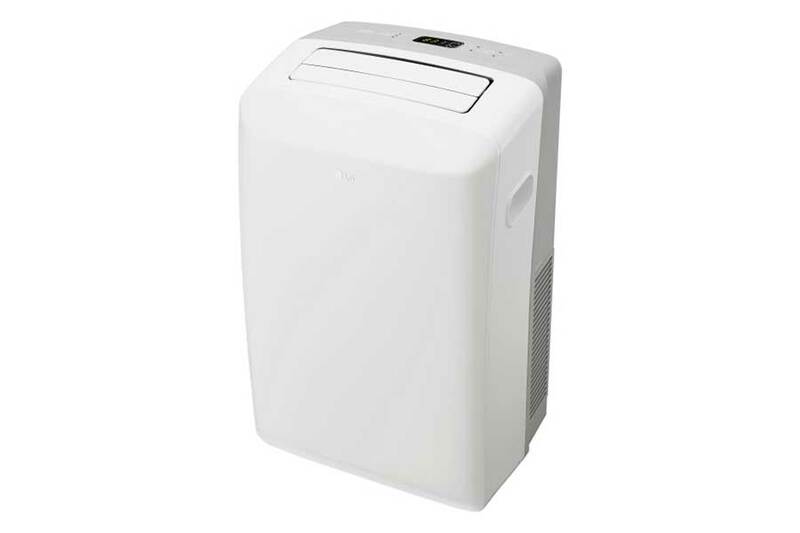 The LG LP0817WSR 8,000 BTU portable air conditioner is designed to cool and dehumidify your bedroom, baby nursery, home office or smaller living room. It’s fairly compact and has wheels, meaning you can move it from room to room easily. The setup process can be done without calling a pro, although some people may struggle setting up the window vent. Despite its size, it’s quite powerful. Several LG owners say it cools the room to an almost chilly temperature. So if you have a specific room that tends to get hot and musty or doesn’t receive enough cool air from the central AC, the LG portable air conditioner will definitely help. Keep reading this review to learn more about LG's best small room portable AC unit. Easy to move from one room to another. At 8,000 BTUs, the LG LP0817WSR is not the most powerful portable air conditioner you can buy. There are others such as the Honeywell MM14CCS that are much more powerful but also more expensive. But if you are looking for a powerful mid-range portable air conditioner for a single small room, the LG LP0817WSR 8,000 BTU is perfect. It is designed for rooms measuring up to 200 square feet. So as long as you use it in the right sized room, it is just as powerful as bigger air conditioners are in larger rooms. Some great places to use it include your home office, master bedroom or home library. It does two things: fill the room with cool air and remove excessive moisture (humidity) from the air in the room. As I mentioned, go for a larger – preferably over 10,000BTU – portable AC if you want to cool a large room or two connected rooms. But be prepared to spend no less than $400 and in most cases well over $500. But if you just need to cool a small to mid-sized room, then the LG 8,000BTU is great, and you will spend less than $300. One of the main advantages of portable air conditioners is their…well, portability. That is the case with the LG 8,000BTU AC. It weighs around 58 pounds. This is much lighter than many portable air conditioners, and you can easily move it from one room to other thanks to the attached wheels. Unless you are going up or down the stairs, you can move it easily on your own. This gives it more versatility - you can use it in your home office during the day and then move it back to the bedroom at night. The unit is compact, too - it measures 17 inches wide and 27 inches high, so it will easily fit through any doorway. Since it takes up the very little room, you can set it up almost anywhere with the only requirement being that it be near a window for venting. This portable AC unit is easier to use and maintain compared to central ACs. You don’t have to deal with miles of ductwork, wiring and installation work. Just plug it in and go. 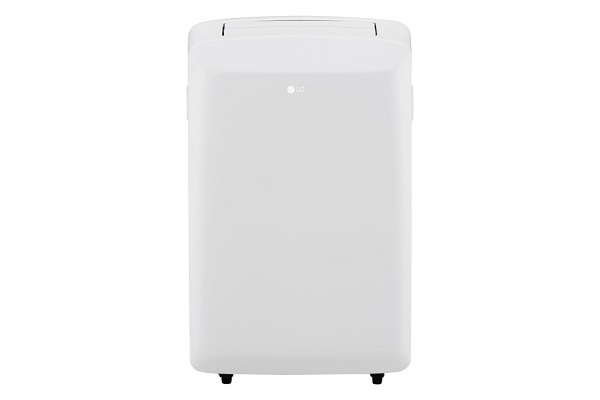 Once you have set it up (which takes around 2 hours or 1 hour if you have used a portable AC before), the LG portable air conditioner is ready to go. Note that it comes with its window installation kit. On the front you will find a control panel with an LED display panel and three buttons on either side of it. With the buttons, you can switch the unit ON/OFF, set a timer, increase or decrease temperature, change the mode and control the fan. The timer allows you to leave the unit on for any amount of time up to a maximum of 24 hours. It will shut off automatically after the timer has elapsed. This comes in handy when you are going to bed and don’t want the AC to run all night long. You can also set the unit to auto-restart at a set time. If you don’t want to press all these buttons, LG includes a handy LCD remote control together with the unit. Another feature to note: the unit uses an auto evaporation system to deal with all the moisture it collects from the room. So you don’t have to worry about having to keep emptying a water bucket. On the side of the section where the cool air blows from, you’ll notice a series of louvers. They can swing back and forth automatically, or you can use the remote control to move them. As they move, they provide better ﻿﻿air ﻿﻿circulation in the room, preventing uncomfortable hotspots. Some customers have difficulty setting up the unit, especially installing the window kit. Use the manual and LG’s website to help you install it properly. Just assume it to take longer than expected. Considering that this portable air conditioner is made for small rooms, the noise is noticeable, kind of like a loud white noise or a ceiling fan set on high. But you’ll get used to it. Some people even enjoy the noise, finding it soothing. The LG 8,000 BTU portable air conditioner is one of our favorite single-room units for small to mid-size rooms. The price is good; it is fairly easy to set up and easy to use. Most importantly, it offers powerful cooling and dehumidifying performance.